(cc-ing Palo Alto mayor Yiaway Yey and CIO Jonathan Reichental, also Allison Arieff of San Francisco Planning + Urban Research Association, and Alexandra Lange of Design Observer). This is an idea I had recently for improving and encouraging pedestrian experiences. 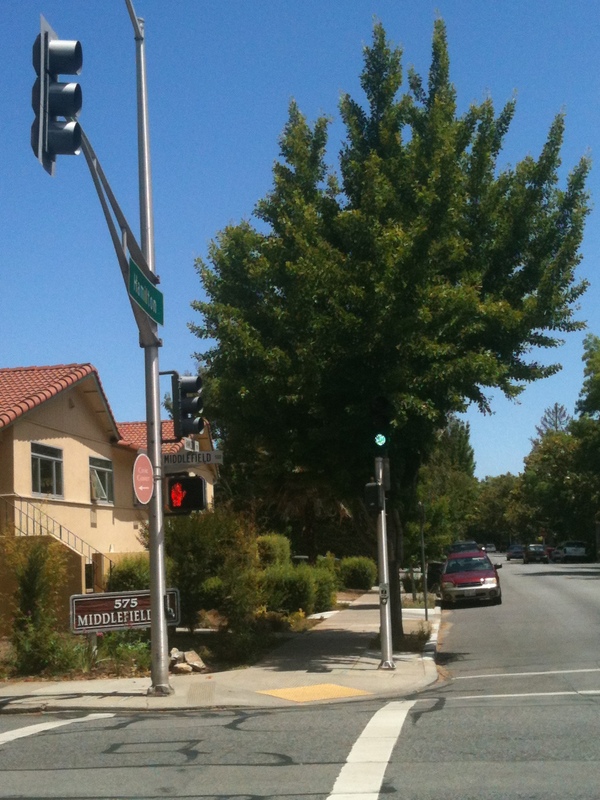 It came about because I walk extensively around Palo Alto, as my primary means of getting around, and I started wondering why I so often seem to find myself jaywalking here, in this generally residential and pedestrian-oriented city. The key experience was realizing that, again and again, on Middlefield Rd. (on which I live), Page Mill Rd., and others, I find myself standing at an intersection, with a green light for traffic going my way, but a red “Don’t Walk” sign. There may or may not be traffic turning across the crosswalk, or a turn light directing traffic to do so. It seems to just be a signal configuration, common here as it is elsewhere, in which the walk signal has to be requested by a pedestrian, and otherwise doesn’t show. Of course, the problem with this, from a pedestrian’s standpoint, is that it may force an interruption and delay at every single intersection along a path, and frequently it will tell you to not walk when there is not even any traffic. While cars can increase speed to make up for traffic-light delays, pedestrians usually move at a consistent speed, based on their exertion and ability level, and so they lose all the time for which they are interrupted. Signs/signals configured for “walk” only by request represent, and are, a system centered on automobile drivers and only secondarily accommodating pedestrians. It both literally and psychologically impairs pedestrian experience. 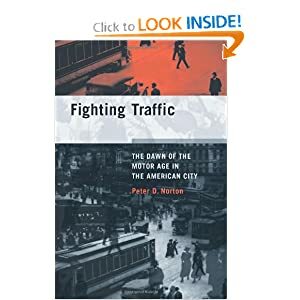 Remarkably to me, it is also commonly encountered, even in highly pedestrian, residential, or urban-designed areas, testament to the ongoing dominance of automobile-centricity in our culture (particularly in traffic/civil engineering). 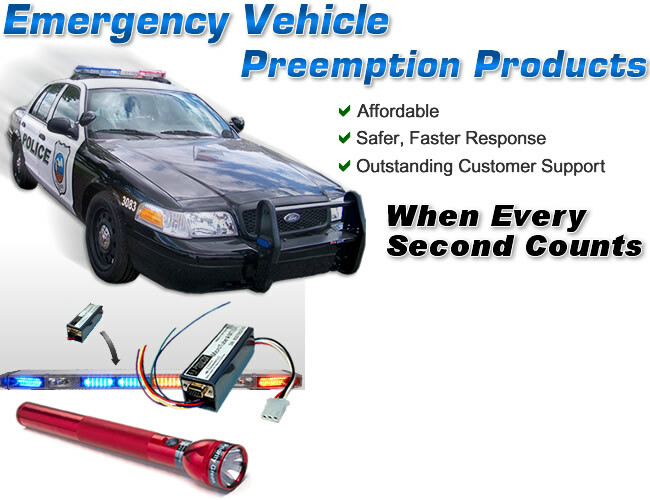 Previously, and emergently today, vehicles were considered to be presumptively at fault in case of collision with a pedestrian, and manslaughter charges were common against drivers involved in accidents. I’ve spent a lot of time at ground zero in this fight. Before living in Palo Alto, I lived for most of 14 years in New York City, and came to embrace the practice of its battle-hardened pedestrians: a red light doesn’t mean no, it means negotiate. (so does a green light, for that matter, but it just means you have a lawyer in your corner). I’ve also lived many years in Portland, OR, a haven of urban planning, transit and pedestrian/bicycle culture. A further dimension to this problem and proposal regards a different constituency from the fit and aggressive like me: what about the elderly, less-abled, and distracted? Walk signals are typically timed to allow a fit and uninterrupted adult to cross the interesection within the signal time. Many people do not fall within that parameter: the elderly, disabled, small children, people with strollers or shopping carts, or someone who dropped something or tripped. Anyone in such a case is put into a hazardous situation by being in the intersection after the light changes. 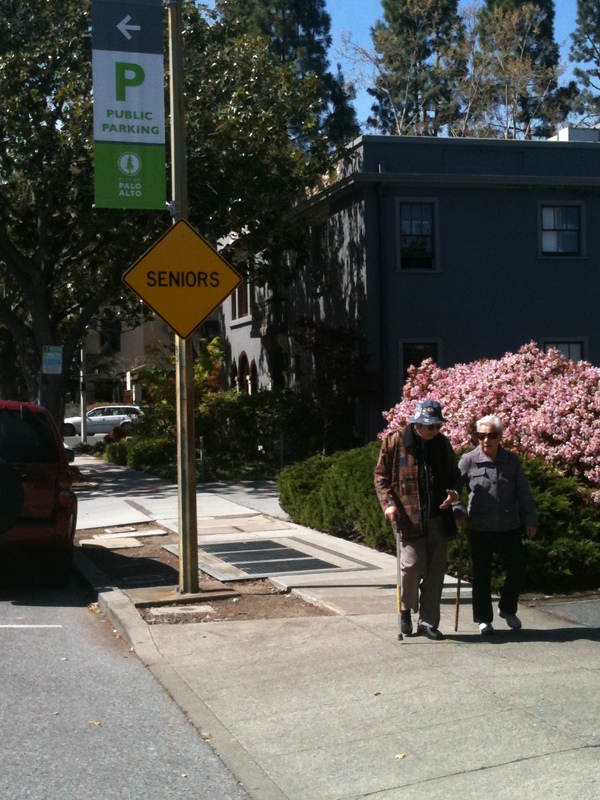 As a matter of fact, I observe this happening regularly, for example near the large senior community around the corner from me, Lytton Gardens, where over 650 seniors live. Having talked to and assisted various residents across the streets, I know that many are often afraid to attempt street crossings because of the short walk signals and (in any case) unpredictable onset of vehicles into their path. So anyway, what to do? What occurred to me is, why not create ways for pedestrians to automatically signal ahead of time when they’re approaching a crossing, or (in the case of elderly/impaired, for example) keep it on walk? standard inductive-loop traffic sensors buried in the road (detects metal mass), and various kinds of traffic signal preemption used by emergency vehicles, train crossings, etc., which may use acoustic, light, radio, or GPS means to signal. (when used to speed transit vehicles, it’s sometimes called bus priority or transit signal priority). The use of these technologies has, as far as I know, always been in support of vehicles, as opposed to pedestrians. This obviously reflects the technology, economics, and policy of who can and will be in a position to preempt, but hey, the beginning is near. Cities are gradually being reengineered away from the auto-centricity which was engineered over the preceding 75 years, and individuals are being radically more empowered by mobile technology. And we’re just talking here about amending traffic signals that already do preemption and remote signalling, not creating entirely new systems. What if streets were built with sensors to detect incoming pedestrian traffic and preemptively request “walk” signals, as they do now for approaching vehicles? What if residents with special mobility needs could get signaler devices to automatically request and hold walk signals so they could more safely cross streets, like police and emergency workers do now for traffic lights? How about a city pedestrian mobile app, which might combine relevant map features, info on related city services and policies, with “pedestrian preemption” tech to help you way-walk, not jay-walk, in your own city? How would you make your town more walkable? Email tim (at) tjm.org, or twitter @mccormicktim.